TV Broadcasters Amp Up The 'Second Screen' Experience : All Tech Considered People have been watching television with their laptops, smartphones or tablets in hand for a while now. It's called the two-screen experience. This year, social media chatter about TV grew by about 800 percent — and broadcasters are trying harder than ever to join the conversation. Broadcasters and other companies spent a lot of time and money this year bringing television to a second screen. Once upon a time, there was one screen that TV broadcasters needed to fill. These days, it's all about the two-screen experience. People have been watching television with their laptops, smartphones and tablets in hand for a while now. But this year, big business tried harder than ever to bring television to a second screen. "This year, I think we've seen a maturity in the social television space, which is still very nascent," says Mark Ghuneim of Trendrr TV, which keeps track of social media around television. "Just looking at this year versus last year, there's been an 800 percent growth in the commentary around TV, real time." In other words, social media chitchat about TV shows was nine times louder this year than in 2011. According to Nielsen, roughly 40 percent of people who own tablets and smartphones watch TV with them every day. Roxane Gay is one of them. "I find television and pop culture in general to be kind of absurd," she says. "And Twitter is a really convenient medium for sharing the ridiculous thoughts that I have while watching ridiculous things." And as more and more people join Gay in her conversation, more and more brands are pushing toward the second screen. Take a show like Survivor. "They have a hashtag for something like #ImmunityChallenge, so that you can see other people talking about it," says Gay. "And so television shows, I think, are realizing that people are starting to consume television differently." Every tweet with #ImmunityChallenge will fall into one, searchable feed. So when CBS places a hashtag on Screen No. 1, they're essentially creating a chat room on Screen No. 2. And online chatter is just one of the things that second screens are used for. Ghuneim says people also want to learn about what they're watching. "Picture, you know, a fantasy football league while you're watching your game," he says, "or data around sports as it's happening." 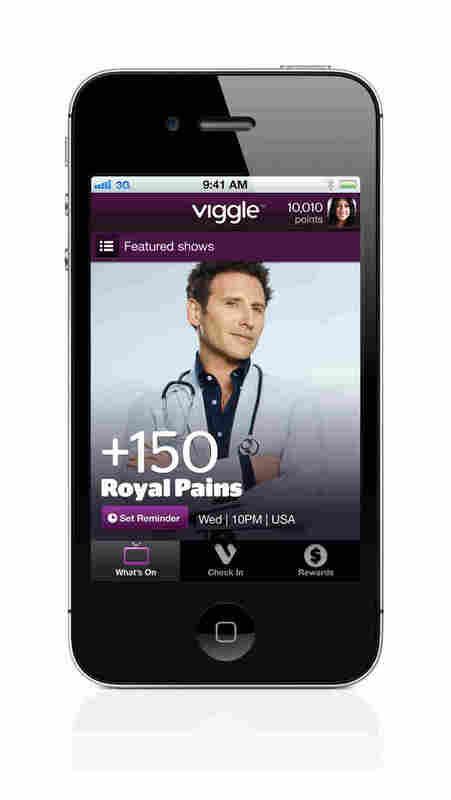 There are also reward-based apps, where viewers get social cred for checking into shows, Ghuneim adds, "like GetGlue, where you get stickers for checking in; and Viggle, where you earn points that can add up to value cards and things like that." Add to that, gaming experiences, shopping experiences and direct interaction with the show itself. This past year, a technology called automatic content recognition, or ACR, synced up screens like never before. The Next Iron Chef IntoNow app, introduced last month by the Food Network and Yahoo, automatically links TV and tablet. Susie Fogelson, a senior vice president of marketing for the Food Network, says it's "the best of the best of the second-screen experience." So how does it work? Let's say chef Alex Guarnaschelli is in a cook-off. "Say she makes a frittata and she doesn't know whether that was the right use of egg or not," Fogelson explains. "And then literally right after that kind of final decision, you will see a video that is really exclusive to the app that talks about whether that was a good decision or not." For businesses, there are a ton of upsides. Ghuneim says that once brands have grabbed someone's attention with the television, they can use the second screen to keep them locked in. "You could have a 30-second commercial that is triggering a seven-minute experience with a brand," he says — as when a company uses a commercial to direct users to their website, or to Facebook and Twitter. "If that call to action or handoff is meaningful," says Ghuneim, "the user will explore it." And once the TV watcher starts watching their phone instead, who's to say they're looking at the other screen? "The dominant screen might be for you talking to your friends around the show," says Ghuneim, "versus the other way around." Next year, the Nielsen Twitter TV Rating will begin tracking the buzz around television.